Along with most of the other rock formations of Yosemite Valley, El Capitan was carved by glacial action. Several periods of glaciation have occurred in the Sierra Nevada, but the Sherwin Glaciation, which lasted from approximately 1.3 mya to 1 mya, is considered to be responsible for the majority of the sculpting. 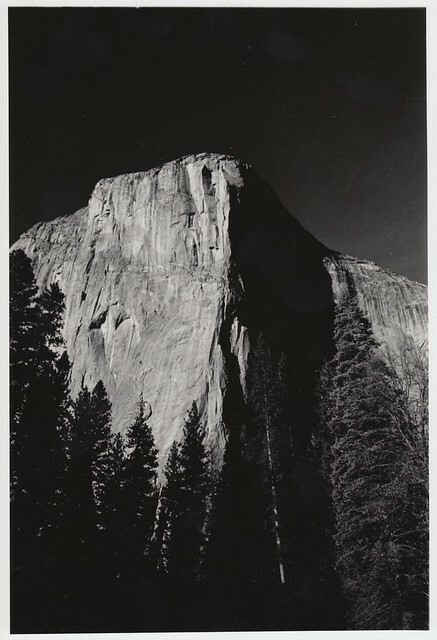 The El Capitan Granite is relatively free of joints, and as a result the glacial ice did not erode the rock face as much as other, more jointed, rocks nearby. Nonetheless, as with most of the rock forming Yosemite’s features, El Capitan’s granite is under enormous internal tension brought on by the compression experienced prior to the erosion which brought it to the surface. These forces contribute to the creation of features such as the massive Texas Flake, a large block of granite slowly detaching from the main rock face about halfway up the side of the cliff. This entry was posted in California, Yosemite by Damon. Bookmark the permalink.